QUEENSLANDERS have been warned to brace for tornadoes, huge hailstones and damaging winds as a massive weather system passes over the state's southeast. The Bureau of Meteorology (BOM) this afternoon issued a severe weather warning, advising there were threats of destructive winds and very large hailstones "with the potential of a tornado". Multiple dangerous thunderstorms are have already wreaked havoc in the North and South Burnett regions west of the Sunshine Coast, and are expected to cause further damage for several hours as they track northeast. Residents of the area north of Lake Boondooma and ranges south of Gayndah have been warned to move card under cover, secure loose items and seek shelter. But either side of Brisbane and the Gold Coast it absolutely pelted down with the heaviest rain in eight months to the north in Bundaberg and hail to the south in Coffs Harbour. 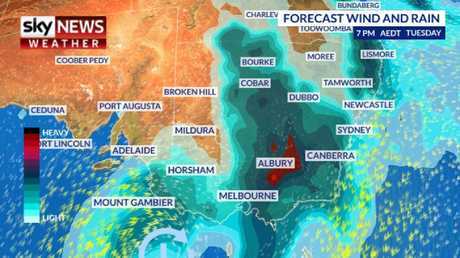 Meteorologists have said the system plaguing the east coast shows little sign of abating and could easily bring 100mm or more rain in the coming days. On Wednesday, a man was killed when a tree crushed his home west of Bryon Bay during a storm. 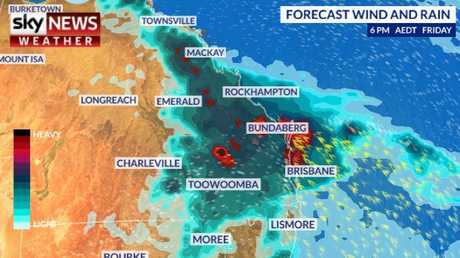 On Thursday afternoon, the Bureau of Meteorology (BOM) said a "very dangerous" storm was heading towards Kingaroy and the Sunshine Coast. "Tennis ball-sized" hail has been reported in Kumbia, west of the Sunshine Coast, where the storm has already hit. A woman, her baby and two other women were injured when their car was pelted with hail in the South Burnett, Queensland. Weather watchers are also now tracking another low-pressure system coming in from Western Australia and this one could bring storms to parts of the country that have been relatively unscathed this week. Victoria, consider yourselves on supercell watch. The time of the year is peak thunderstorm season for the east coast as warmer surface temperatures meets colder upper level air creating instability. 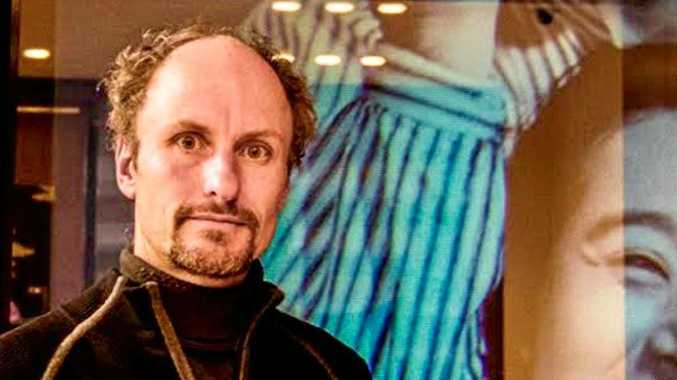 "It's a massive end to the week in Queensland, but next week some pretty wild weather is on the cards for southern parts of the country," Sky News Weather channel meteorologist Rob Sharpe said. 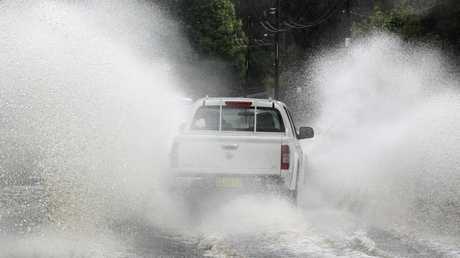 Yesterday, Bundaberg saw 29mm of rain, its heaviest in 24-hour period for eight months. In NSW it was even more sodden. Gosford, on the Central Coast, registered 54mm in the gauge, Ballina saw 68mm and Spicketts Creek, west of Nambucca Heads, had a 120mm dumping. Tragically, a man died 20km west of Byron Bay when a large fig tree fell during the storm crushing a property. The system slowed on its journey north towards Queensland. As it passed into the sunshine state after dusk, much of the humidity, which can supercharge storms, had dissipated which dampened its effect. However, it is continuing its travels and that means areas of the Queensland coast north of Brisbane are potentially in store for a serious amounts of moisture. Friday to Monday could see a whopping 165mm of rain drench Bundaberg. Even the minimum predictions are for 100mm. Up to 150mm could fall on Noosa. 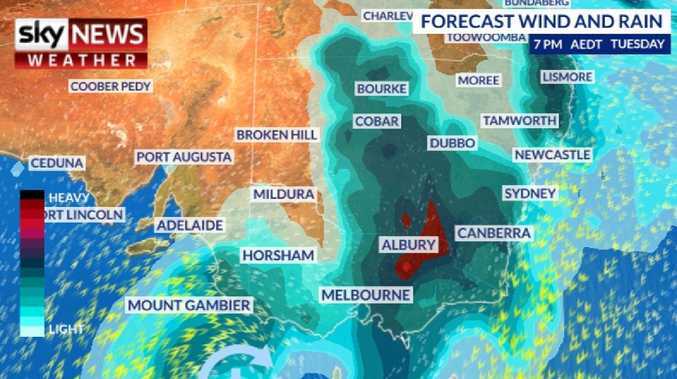 "Into Thursday, the storm risk shifts further north in an area from Wide Bay-Burnett down to the Darling Downs and Bourke, Walgett and Moree areas," Mr Sharpe said. "On Friday, rain will intensify over Wide Bay-Burnett and up through central parts of Queensland. Some of the storms could see the odd supercell on Thursday and Friday." South of the band, rain can still be expected with Brisbane on course for between 30-80mm on and around the weekend. Northern NSW will remain damp while showers are a chance every day for the next week in a cloudy Sydney. 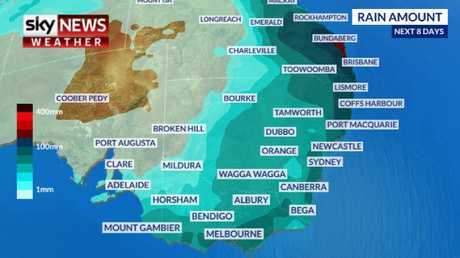 Canberra could get a sprinkling on a mild weekend. Attention is being draw to a developing front in Western Australia which could cause some drama both there and, later on, in southern states. Perth could easily see 25mm of rain over the weekend with a storm on Saturday. "The next threat's coming from Perth. As the system moves east it could link up with the moisture that's been hanging around there for some time," Mr Sharpe said. "It looks like it will intensify possible on Sunday but definitely by Monday. The storms could be especially severe, supercells storms once again, but this time through the southern part of the nation." Nasty thunderstorms, supercells are rotating systems which have a habit of hanging around for longer periods of time. The BOM states supercells are thunderstorms that can have the most destructive impacts and are "fascinating but dangerous". Ahead of a possible storm, Melbourne will be gloriously sunny this weekend with temperatures reaching 25C on Sunday. Adelaide will reach 29C on Sunday with cloud and some showers continuing into the early part of the week. Hobart will see some rain on Friday but a mostly sunny weekend peaking at 23C on Sunday. It will be stormy up in the Top End. Highs of 33C in Darwin with possible thunderstorms on the weekend.